hey man whats the website you got your grille from? Hey Man, truck looks perfect! IMO 4" lift & 35 is ideal. Just wondering if you left the level since it looks higher than a 4" in the pics. Did you lose much power as well as MPG's? thanks, good luck with it! Hey man, I want to buy your Icon coilovers if you still have them. PM me. Hey man just wanted to say thanks I googled 22" wheels and yours came up. I decided that was the only way to go. 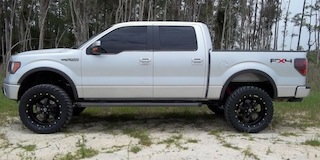 Turned out awesome 35" toyo m/ts on 22" death metal novakanes 2" front level and airbags in the back. Not to sure how to work the pictures yet. Just wanted to send a thanks your way for keeping me stuck on the bmfs! Cheers! Hey bud your truck is cleann. Not overdone, looks awesome bro. I need to know where to get the blacked out badges? I want them so bad. hey man, i like the pics of your trucks. you seem to know wheels for newer fords, i just picked up a '12 fx4. what size 20's should i get for it once my stock tires wear out? i'm planning on leaving the suspension alone. I gather you had the ICON F-150 2WD Suspension System installed on your 4x2. I'm getting a 2012 LWB Super Cab with max tow and payload. Did you like the ICON and would you recommend it as the best long term way to level/Lift my truck? It'll have LT265/70R17s on it but I may consider LT285/70R17s when I replace them. I also want to install fender flares on it but can't decide to go with the street flare or the next larger size. I'm not trying to make it look like a 4x4 just more aggressive and less like a work truck. I'll be carrying a 1,000 lb ATV in the back while towing a small TT. BTW I like the way your trucks end up looking. I have a bone stock 2010 4x4 Lariat SuperCrew with 20" wheels. I do not want to do anything to the suspension at all. Will 305/55/R20's work without rubbing? I cannot find a good answer on the board. Thank you.